I still get excited at trying new recipes, especially a recipe as different as this one. I don’t often use cream cheese but decided that for these amazing Cloud Bread baps, I would use some and the result was amazing. This Cloud Bread is not actually ‘bread’ but it is so soft, airy, fluffy and delicious that as a bread replacement it is excellent being almost carb-free, gluten-free and high in protein. There is no need to sweeten them unless you want a slightly sweeter bap (I put a tiny squirt of runny honey into my first batch). I sprinkled my first ones with sesame seeds as I was using them as a burger bun and they even looked the part. One recipe suggests putting a slice of tomato and melted mozzarella on top; another tops with rosemary or cracked pepper. They can be used either hot or cold, as a bun or as a sandwich. Mix together the egg yolks, cream cheese and honey (or sweetener of choice) until smooth. In a separate bowl, add the baking powder to the egg whites and whisk until they are stiff and form peaks. Slowly fold the egg yolk mixture into the egg whites and carefully mix together. Don’t beat as you will collapse the mix. Do this as quickly as possible and then spoon about 8 to 10 even-sized rounds on to lightly greased trays or baking parchment. Sprinkle the rounds with sesame seeds, rosemary or your favourite herbs/spices. Bake at 160°C for about 20 minutes, or until they are well risen and golden brown. Carefully remove from the tray and cool. I didn’t have any chicken or turkey burgers and wanted to use up a couple of chicken thighs I had in the fridge. I topped these with a quickly made tomato salsa (tomatoes, onion, garlic and mint) and one was topped with a slice of mozzarella cheese. 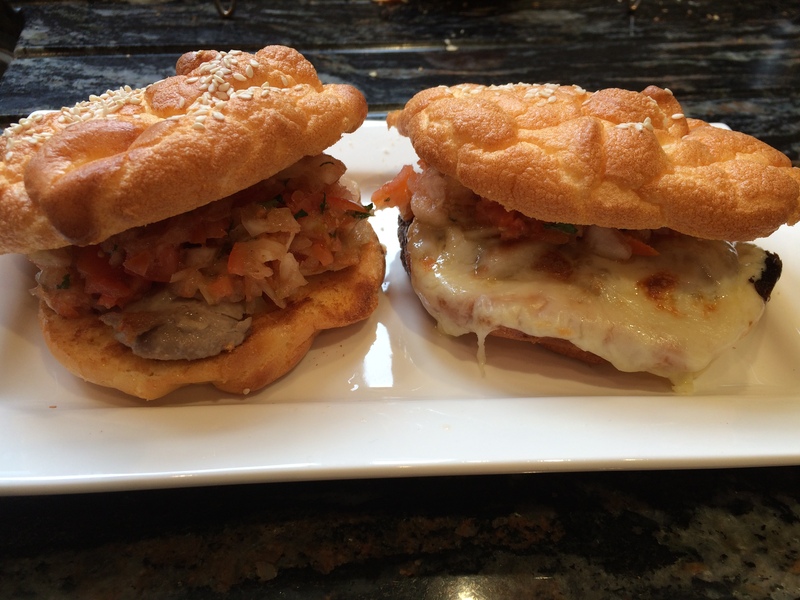 The Cloud Bread baps worked really well and were extremely light. If not using straight away, cool and seal in an airtight tin. This entry was posted in Breads and tagged Bread, Burger Buns, Cream Cheese, Gluten Free, Healthy Eating, Wheat-Free. Bookmark the permalink. I was made pizzas on cloud bread! It was very interesting to eat but a really good gluten free alternative for a pizza base. I had left over bases with jam the next morning for breakfast. A good idea for a pizza base. 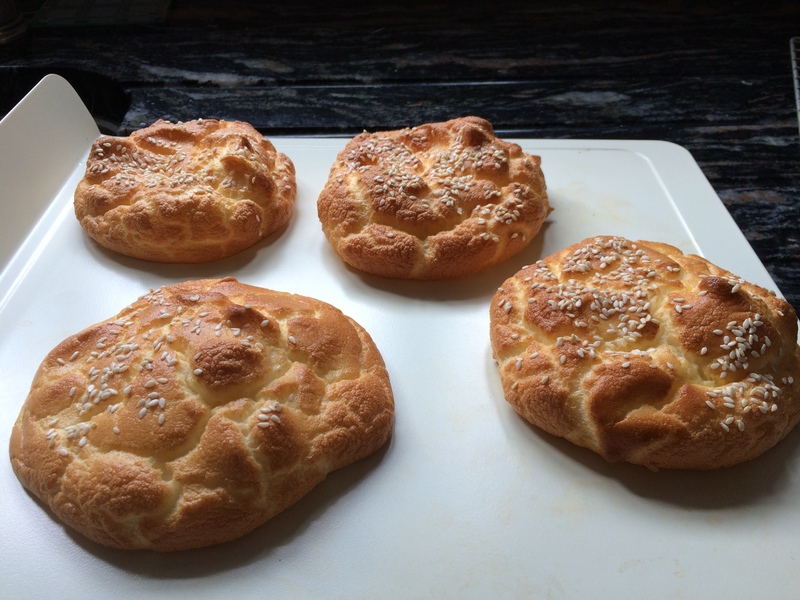 I usually use a cauliflower base but will try a Cloud Bread one next time.